Medical researchers have received approval to begin safety and performance testing of the Wearable Artificial Kidney. The federal Food and Drug Administration and the University of Washington Institutional Review Board accepted the protocol for the clinical trial. Expected to start this autumn in Seattle, it will be the first human study in the United States to be conducted on the device. 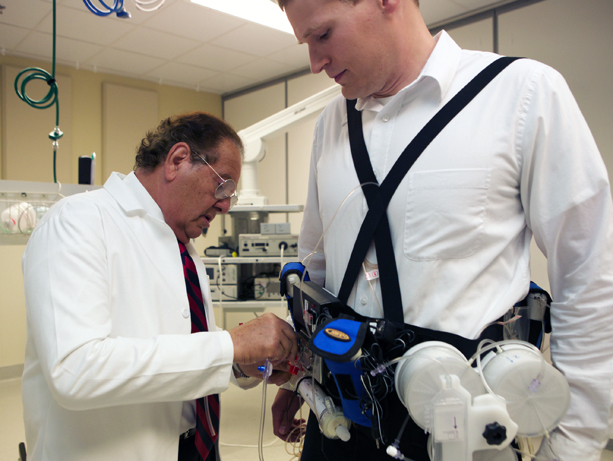 The Wearable Artificial Kidney, also known as the WAK, is a miniaturized dialysis machine that can be worn on the body. The carrier resembles a tool belt; the device connects to a patient via a catheter. Like conventional dialysis machines, it is designed to filter the blood of people whose kidneys have stopped working. Unlike current portable or stationary dialysis machines, it can run continuously on batteries and is not plugged into an electrical outlet or attached to a water pipe. The present version weighs about 10 pounds, but future modifications could make it lighter and more streamlined. Dr. Victor Gura of the University of California, Los Angeles, said, “My team invented the device to untether patients from large dialysis machines.” His group wants to give patients with end-stage renal failure the mobility and freedom for such routine activities as walking or shopping while their dialysis runs. Currently dialysis patients have little ability to move about during dialysis. Treatments are time-consuming: Sessions occur about three times a week and last three to four hours. “The Wearable Artificial Kidney concept is supported by laboratory data, animal model data, and some limited human study experience,” said Dr. Jonathan Himmelfarb, director of the Kidney Research Institute and UW professor of medicine in the Division of Nephrology. The device has been briefly tested with a few patient volunteers in Italy and Great Britain. The WAK project was one of three proposals, out of 32 applications, chosen by the FDA to participate in its Innovation Pathway program. The FDA designed the Innovation Pathway to help safe, breakthrough medical products reach patients in a timely manner. The End-Stage Renal Disease Challenge, issued in 2012, focused specifically on innovative devices that addressed kidney failure, which is a growing public health-care concern in the United States. The WAK has been in development for more than a decade. Gura originated the project at Cedars-Sinai Medical Center in Los Angeles and the David Geffen School of Medicine at UCLA. It has evolved to include the Kidney Research Institute, a collaboration between Northwest Kidney Centers and UW Medicine, and the Department of Health Services in the UW School of Public Health. The inventor is affiliated with Blood Purification Technologies Inc., in Beverly Hills, Calif.
“Since being selected, the study team has worked closely with the FDA to bring the WAK to its present stage of development and to plan human testing,” said Dr. Larry Kessler, professor of health services at the UW School of Public Health and former FDA official. detail image of the wearable artificial kidney's filtration system, right, and one of the auxiliary pumps, left. The agreement with the FDA and the UW Institutional Review Board for the pending safety and performance study includes strict criteria for inclusion of patients, and several other restrictions on eligibility. Up to 16 patients will be accepted, with the goal that 10 will complete the full trial. The testing will take place in an inpatient hospital setting at UW Medical Center in Seattle. Blood samples will be drawn periodically throughout the 24 hour test. Other clinical measurements will be made during and after treatment with the device. The patient volunteers then will be observed for at least 28 days. Due to logistics, the Seattle team will recruit local patients only. The safety and performance of the device must first be confirmed before any additional studies are held. The device will not be generally available for patients until it is fully evaluated, so the roll-out is not yet slated. In the future, if preliminary tests go well, researchers hope to determine if any benefits arise from slow, steady dialysis to mimic the natural, around-the-clock clearance of normal kidneys. Charitable gifts and the Wearable Artificial Kidney Foundation are funding this trial. Patients and families affected by end-stage kidney disease established the WAK Foundation. Editors: Media contact is Leila Gray (206.685.0381; leilag@uw.edu). Download high-resolution images of the device and its developes. Read a document of Frequently Asked Questions about the device and its testing. View a YouTube video of Dr. Himmelfarb discussing the device.